Say hello to Moon Pie Pie. No, that’s not a typo, and no, I didn’t keyboard-stutter. Moon Pie Pie is the name of the new dessert I came up with last week, a crazy cookie-candy-pie hybrid. See, it’s a pie…with all the ingredients of classic moon pies. Ya dig? Silly name, serious taste. Get on board! It all started with a dream. Yes, much like the Reverend Dr. Martin Luther King Jr., I too had a dream for the future. But unlike his inspiring, world-changing dream, mine was decidedly more banal. 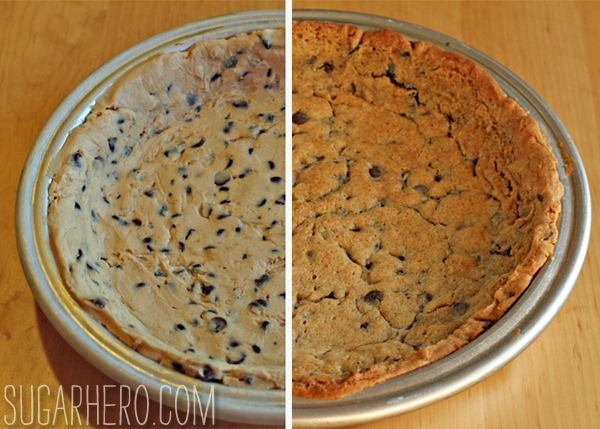 I dreamed about making a chocolate chip cookie dough pie crust. I could fill this pie crust with ice cream, or whipped cream, or pudding…the possibilities were endless, and the future was bright! After all, how hard could it be to press a little cookie dough into a pie tin? …yeah. It turns out that turning cookie dough into a pie crust is really difficult! I wanted it to be thick and soft on the bottom, like the best chocolate chip cookies, but it also needed to be sturdy enough to hold its shape along the edges without collapsing during the baking process. Finding the right balance between these two elements was difficult, and I’m sorry to say we had to eat a few failed attempts before I hit on the right combination of ingredients. It took multiple cookie dough eating/thinking sessions, but Jason & I finally brainstormed the perfect dessert. Moon Pie Pie takes its cues from old-fashioned moon pies. If you’re not familiar with them, moon pies are cookie sandwiches that have a marshmallow filling and are dipped in chocolate. They’re fun and retro and super sweet, aka all of my favorite things. So how do moon pies turn into Moon Pie Pie? Well, I’ve already mentioned the chocolate chip cookie crust. This soft and tender crust is topped with a thick layer of chocolate ganache. 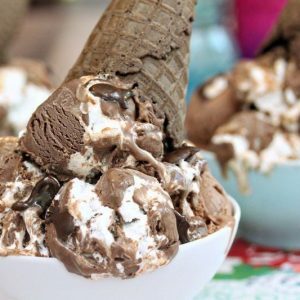 Finally, the whole thing is finished with thick, fluffy vanilla meringue that’s torched until golden brown, so it has a toasty marshmallow flavor. And of course, I couldn’t resist drizzling on a little more chocolate sauce. It wouldn’t be Moon Pie Pie if it wasn’t over the top! I was going for a celestial theme, so my Moon Pie Pie was finished with some gold leaf, which is completely unnecessary and impractical, but hey, look—sparkly! We absolutely loved the combination of cookie base, rich truffle filling, and light and fluffy meringue. With its unique taste and great looks, I think this dessert will make regular appearances at our dinner parties. It is definitely sweet, but I used a pretty dark chocolate in the ganache, which helped balance things out. 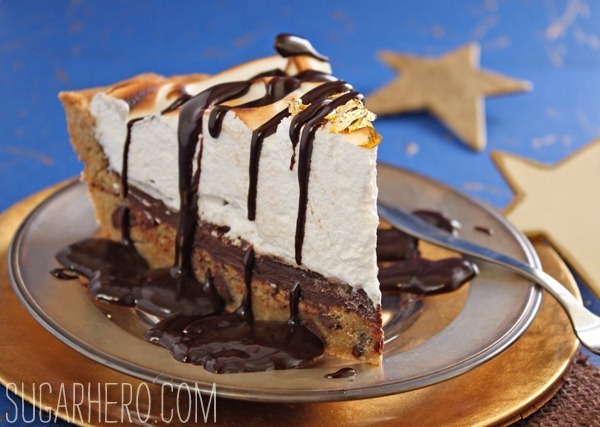 You could also cut the meringue in half and have a much thinner layer to reduce the sweetness. Like most meringue desserts, this one doesn’t have a lot of staying power. 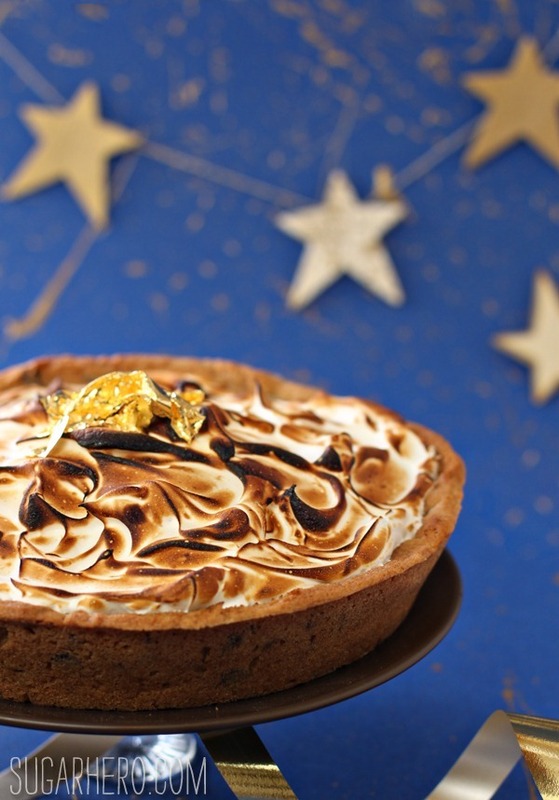 It should be enjoyed the same day it’s made, ideally within 3-4 hours of adding the meringue. We definitely still ate it several days later, but the meringue becomes spongy over time, and weeps down into the cookie layer, making for a less appetizing look and texture. If you need to work ahead, you can make the cookie/ganache portion several days in advance, and then add the meringue shortly before serving. 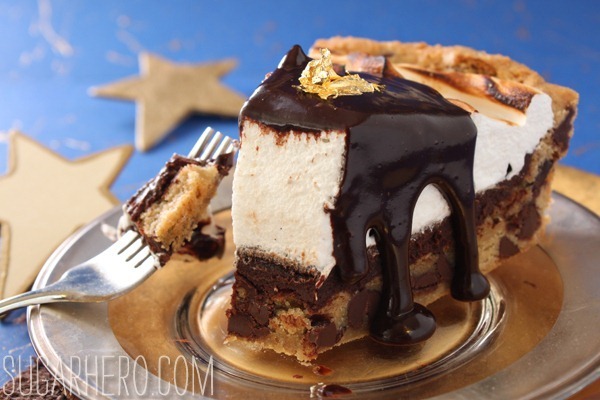 This unique Moon Pie Pie is a giant version of the popular moon pie cookie. 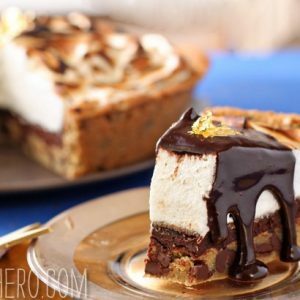 A thick chocolate chip cookie crust is filled with homemade toasted marshmallow and topped with chocolate ganache. Spray an 11” pie pan with nonstick cooking spray. In a small bowl, whisk together the bread flour, corn starch, baking soda, and salt. Set aside for now. Place the butter and both sugars in the large bowl of a stand mixer fitted with a paddle attachment. Mix them together on medium speed until well-combined. Although some cookie dough recipes call for the butter and sugar to be creamed until they’re light and fluffy, you want to stop before that point, and mix them just until they’re well-combined. Beating too much at this stage will incorporate too much air and make the cookie dough soft. Add the egg, egg yolk, and vanilla extract, and mix again on medium until they’re combined. Stop the mixer and add the dry ingredients, then mix on low until the drys are almost entirely incorporated, with just a few streaks of flour remaining. Add the chocolate chips and stir them in by hand. Scrape down the bottom and sides of the bowl with a spatula and stir everything well. The dough will be stiff. Press the dough into the bottom and up the sides of the pie pan. Try to make the bottom thicker than the sides, so it will stay moist and soft while the sides get crispier and more firm. If you have the time, refrigerate it overnight to get the most optimal texture and flavor. If you don’t have time, refrigerate it for at least 2 hours, until firm. When you’re ready to bake, preheat the oven to 375 F and place the pie shell in the freezer to get really cold while the oven preheats. Once preheated, spray the pie lightly with nonstick cooking spray and press foil over the bottom and sides of the pie. Fill the foil-lined shell with beans, rice, or pie weights. Bake the shell at 375 F for 20-25 minutes, rotating halfway throughout. Bake it until the sides are light golden and look fairly set. Remove the shell from the oven and lower the heat to 350. Carefully take off the foil and beans, and return the pan to the oven. Bake for an additional 15 minutes, until the crust is puffed and light golden in the center. If the sides seem to be getting too dark, cover them with a ring of foil. Let the crust cool completely before filling. It’s a good idea to make the ganache when you make the cookie dough, so it’s ready as soon as you’re ready to use it. Place the chopped chocolate in a medium heat-safe bowl. Pour the cream into a small saucepan, and heat it over medium-high heat until it simmers and is just under a boil. Pour the hot cream over the chopped chocolate and let it sit for one minute to soften the chocolate. Whisk the cream and chocolate together until the chocolate melts and the ganache is smooth and shiny. Press a layer of cling wrap on top of the ganache, and let it sit and thicken at room temperature for several hours. (You can speed the process up by putting it in the refrigerator, but don’t let it get rock hard!) It’s ready when it’s the texture of peanut butter. Scrape most of the ganache into the cooled, baked shell, reserving 1/2 cup to drizzle on top of the pie (optional). Spread it into an even layer. Place the egg whites and salt in the bowl of a large stand mixer that is completely clean and dry. Begin beating them on medium speed with a whisk attachment, and gradually raise the speed to medium-high. Once the whites are opaque and hold soft peaks, start adding in the sugar, 2 tbsp at a time. Beat well in between each addition, and take your time! Adding the sugar too quickly will make your meringue gritty. Once all of the sugar has been added, continue to beat on a high speed until the whites are glossy, thick, and hold firm peaks when you stop the mixer and remove the whisk attachment. When you reach the proper stage, add the vanilla extract and quickly stir it in. Scrape the meringue on top of the ganache in the pie shell, and spread it out evenly. 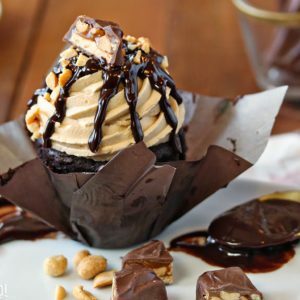 Use a spatula to create beautiful peaks and whirls on top. 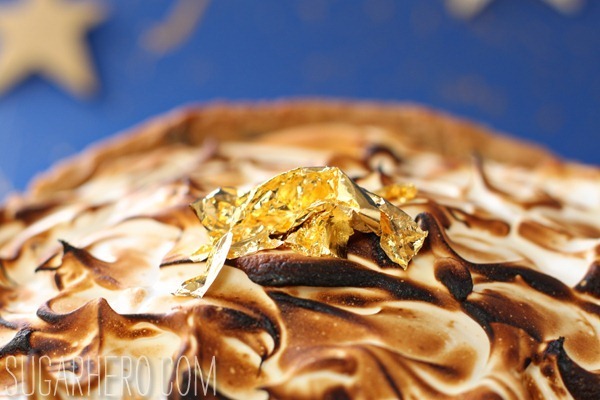 If you have a kitchen torch, torch the top of the meringue until it is golden brown all over. If not, set the pie and a baking sheet and put it under your over broiler. Watch it like a hawk! It will be quick to burn, so monitor it carefully and turn the pie as necessary to prevent hot spots. Once the pie is toasted on the outside, let it cool briefly before serving. If desired, melt the reserved ganache in the microwave and drizzle this as a chocolate sauce over the top of the pie slices. This pie is best enjoyed the day it is made. I used an 11” deep dish pie tin for this recipe. If you don’t have one, good substitutes might be a similarly sized cast iron skillet, a cake pan, or a springform pan, but you might need to adjust the baking times to compensate for the different pan. I love the name of this pie! 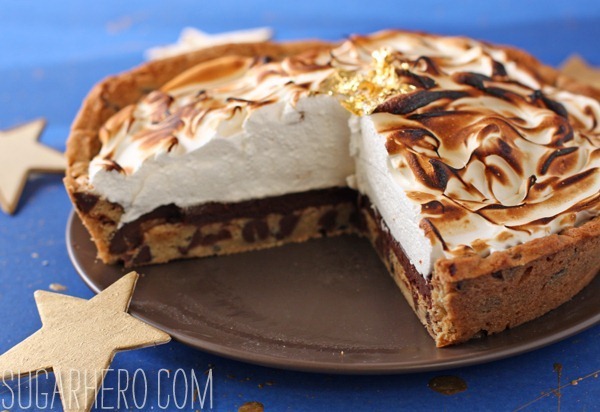 It looks delicious and I would gladly eat a slice- weeping meringue and all!! Oh my goodness. I can’t stop watching the animation… It’s mesmerizing and I’m easy to amuse. Haha! Funny you said that, because we have our own Moon Pie Pie accent. But instead of Cartman, it’s more of a polka-influenced “oom-pah-pah” rhythm. We actually wrote a song about it. Moon-Pie-Pie, Moon-Pie-Pie, Moon Pie for two! Moon-Pie-Pie, Moon-Pie-Pie, Moon pie for three! Obviously I’m not quitting my day job over here. This looks sooo good! I recently tried my first moon pie. It was amazing! Your moon pie pie sounds very delicious! 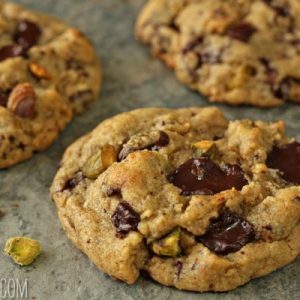 Love the idea of making the crust a chocolate chip cookie. That thick, fluffy vanilla meringue. Wow. And who would want to reduce it by half. Live abundantly. The flavor of Moon Pies is just amazing. I recreated Little Debbie Star Crunch this week. And lots of people don’t know what they are; but you may. And I surely know what Moon Pies are and your creation is beyond words spectacular! Oh wow yum, that looks and sounds absolutely divine! Love love love the progression photos- awesome job. 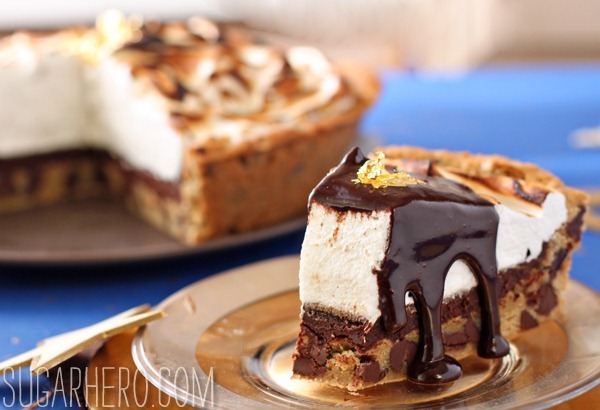 This pie looks incredible! Ok, this is why you are my baking idol. This recipe was absolutely one of the BEST desserts I have ever made. I wanted to make something fun for our 11th anniversary and this just fit the bill. First of all, the crust is PERFECT. Crispy on the sides and then wonderfully soft, chocolate-chip-cookie-of-your-dreams on the bottom. I did change it up, just a tad because I’m a crazy marshmallow fanatic and remain kinda on the fence with meringue. So instead, I made homemade marshmallow fluff for the top and browned it in the broiler (wish I had a kitchen torch!). WOW. Pretty rich, so a small slice is enough, but I honestly could not stop smiling for an hour after I ate it. People should stop everything and make this- right now. Hi there– I made this pie, and while it tastes great, the cookie crust came out very tough. I followed directions exactly. Any tips for changing it up to make it less hard? Maybe using all purpose flour instead of bread flour? Simply shorten the bake time? More egg? Thanks.